KLM, together with Transavia, increased the number of passengers welcomed on board to 43.0 million in 2018, a significant increase of 1.4 million compared to 41.6 million in 2017. While there was minor growth in the number of flights in the first four months of 2018, Schiphol Airport in April reached the 500,000 flight movements ceiling as determined by the Alders Agreement in 2008. Consequently the limits to growth meant that KLM’s network remained relatively stable in 2018. Four destinations were added, including Fortaleza in Brazil and Växjö in Sweden. (see story A Truly Sustainable Case), while Nantes and Marseilles in France were temporarily taken over from Air France. Three destinations were closed, namely Almaty and Astana in Kazakhstan and Tehran in Iran, bringing the total number of destinations worldwide to 166. Preparations are under way to close Freetown in Sierra Leone, Monrovia in Liberia and to open Wroclaw in Poland and Las Vegas and Boston in the United States in 2019. KLM is aware that, by not being able to grow the number of destinations and flights and by having to close down some destinations, customers may be adversely affected. KLM quickly responds to the changing needs of customers. One such solution is to strive for more seasonality, which means flying to destinations only part of the year. The increased robustness and stability of KLM’s operations now allow for this. In Europe, for example, KLM flies to a range of destinations in Italy and Spain in July and August by temporarily scaling down flights to business destinations, which are quieter in summer. Not content with seasonality alone, KLM is trying to push the boundaries of what is possible in terms of scheduling. In 2018, KLM began preparing for a new event-driven flight to Las Vegas in January to the world-renowned CES technology conference. While the event only lasts three days and it takes considerable effort to organise crew and aircraft, KLM believes such event-driven flights can be profitable. In 2018, KLM managed to make better tactical, operational and strategic use of available slots. 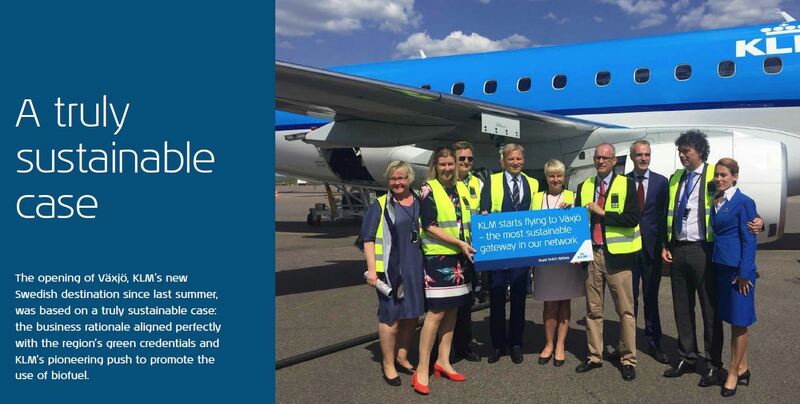 This positively impacts KLM’s planning and fleet utilisation and in the long-run KLM’s ability to grow sustainably. During the first three years of the Perform 2020 strategy, from 2015 to 2017, KLM invested heavily in the modernisation of its fleet. In that period, a total of 42 new aircraft, including KLM Cityhopper and Transavia, entered the fleet and the cabins of the in-service aircraft were upgraded. In 2018, KLM continued its investments and added three Boeing 787-9 aircraft, now totalling 13, enabling the further gradual phase-out of Boeing 747 aircraft. The European fleet was strengthened with the arrival of seven Embraer aircraft of which two E190 and five E175 and two Boeing 737-800 aircraft for Transavia. The Cargo fleet remained unchanged at four aircraft. The total consolidated fleet, excluding the training aircraft, grew from 200 to 209 aircraft. KLM also began to prepare for the arrival of the new 787-10 aircraft, which are at the cutting edge of low noise and CO2 emissions. Compared to the remaining Boeing 747 aircraft which it will replace between 2019 and 2021, it produces around 50 per cent less noise and emits around 30 per cent less CO2 per seat thanks to the same reduction in fuel consumption. In addition, the new aircraft has an upgraded World Business Class section with more privacy, comfort and aisle access. KLM has a two-pronged approach to partnerships, which strengthen the network and enable to reach new markets. Firstly, KLM participates in the transatlantic joint venture with Air France, Delta Air Lines and Alitalia. In May 2018, AIR FRANCE KLM signed definitive agreements that pave the way for the expanded transatlantic joint venture with Delta Air Lines and Virgin Atlantic. The combination of the existing joint ventures between firstly AIR FRANCE KLM, Delta Air Lines and Alitalia and secondly between Delta Air Lines and Virgin Atlantic, within a single joint-venture marks the expansion and reinforcement of one of the most advanced partnership models in the airline industry. The signed agreements are all subject to regulatory approvals which are expected to be obtained in the second quarter of 2019. As a result of the many successful hub-to-hub operations and US West Coast operations, the transatlantic joint venture continues to achieve positive financial results, despite fierce competition and the expansion of new and existing low-cost entrants. Secondly, KLM participates in joint ventures with Kenya Airways, China Southern Airlines / Xiamen Airlines, China Eastern Airlines and Air Mauritius, supplemented by its enhanced cooperation agreement with Jet Airways. Kenya Airways has experienced a challenging year, and in its role as shareholder and joint venture partner, KLM fully supports the continuous and successful restructuring efforts that took place in 2018. The joint venture has been fortified through the inclusion of Air France, which started flying from Paris to Nairobi in 2018. The partnership with China Southern Airlines and its subsidiary Xiamen Airlines performs well. This encompasses a joint venture on six routes and about 40 codeshare destinations beyond KLM’s gateways in China, supporting KLM’s operations in Greater China. In addition, KLM and Air France are developing a new joint venture with China Eastern Airlines, operating from its Shanghai base, complementing the partnerships in mainland China on the prime gateways. These partnerships with China Southern Airlines / Xiamen Airlines, China Eastern Airlines and China Airlines from Taiwan, makes Amsterdam the leading gateway from Europe to greater China and from greater China to Europe with eight destinations served non-stop from Amsterdam. KLM and Air France together with India’s Jet Airways launched an enhanced cooperation agreement in November 2017 to develop their networks and commercial activities between Europe and India. The implementation of this agreement in 2018 enables passengers on Jet Airways aircraft from India to transfer to the KLM network in Amsterdam. Having started with just one flight per day three years ago, the enhanced cooperation agreement in 2018 operated five flights per day to three different destinations in India. KLM expects the number of passengers between the Netherlands and India to grow to more than 1 million per year in 2019. The partnership with GOL showed good results. Some 25 per cent of passengers who travel to Brazil make an onward connection with GOL and are offered 35 code share destinations. This partnership is being enhanced in both the commercial and customer experience fields, in order to be the first choice for customers traveling between Brazil and Europe. In 2018, KLM and Air France together with GOL launched a third hub in Brazil with flights to Fortaleza. KLM plays an important role in the global SkyTeam Alliance and continuously explores new opportunities to strengthen its cooperation with SkyTeam partners, contributing to the expansion of the alliance. KLM was already operating 14 destinations in the Nordic region when, eager for growth, it went looking for another. It ended up being charmed by Växjö, a little-known town with around 90,000 souls in the South of Sweden. KLM approached the airport and the municipality and quickly agreed on a CO2 compensation scheme for flights to and from the airport using KLM’s participation in a reforestation scheme in Panama. Quickly, though, all parties started wondering if that was enough. In a clear sign that others are beginning to follow KLM’s lead, Södra, Sweden’s largest forest-owner association with 51,000 members, became the first non-Dutch organisation to join KLM’s Corporate BioFuel Program, which means when their employees fly with KLM they will contribute to the use of biofuel. An organisation like Södra, which is already involved with biomethanol for cars, could use its forestry byproducts as a source for aviation biofuel as well. And in the meantime the Swedish government has committed a subsidy to conduct an in-depth feasibility study for a biofuel plant in the Småland region around Växjö.